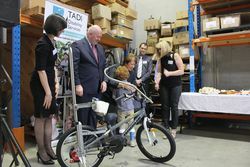 The Governor-General, His Excellency General the Honourable Sir Peter Cosgrove AK MC (Retd) and Her Excellency Lady Cosgrove visited TAD Disability Services and other organisations helping to reduce poverty and hardship, and their clients during Anti-Poverty Week. 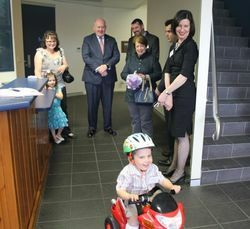 The Governor-General and Lady Cosgrove were greeted by TAD President, Monica Vardabasso and Chief Executive Officer, Danny Kapustin, followed by TAD client, two-year-old Joshua Ryan, who rode up on his special trike, modified by TAD volunteers to enable Joshua, who has Spinal Muscular Atrophy, to ride safely and independently. "All our projects are produced by our wonderful volunteers, there are over 200 across the state and they are our workforce, without them we could not deliver the important projects that we do," Monica Vardabasso, TAD President. The Governor-General and Lady Cosgrove then spoke to volunteers and local TAD clients about custom-designed equipment, Freedom Wheels modified bikes and the Computer Support Service which helps people experiencing financial stress purchase a refurbished computer including ongoing technical support at an affordable price. "To say this is one of these absolute diamonds of philanthropic community support activities would be an understatement,” the Governor-General said. “This is one of those great expressions of compassion and determination in our country, where there are youngsters and people of all ages whose ability and opportunity are limited in some way, but folks say &apos;it doesn&apos;t have to be’,” Sir Peter added. 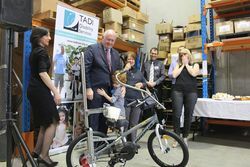 The visit ended with the Governor-General, Lady Cosgrove and Monica Vardabasso presenting a Freedom Wheels bike to six-year-old Mason Tassone, who has very rare genetic condition called Koolen De Vries Syndrome. This condition results in low muscle tone, seizures, balance issues, vision impairment and feeding problems. Mason’s mum, Bernadette, tried having Mason ride a standard bike, however with no success due to the low muscle tone and reduced coordination. 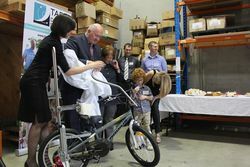 After a successful Freedom Wheels assessment with TAD&apos;s Physiotherapist, Mason had his own Freedom Wheels bike built to his exact specifications to be presented on this very special visit. 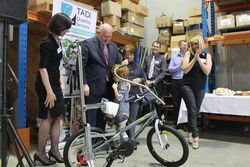 After the bike was revealed, Mason gave the Governor General and Lady Cosgrove a big hug before going for a ride to show off his new bike and meet VIPs including Dr Geoffrey Lee, Member for Parramatta and Mr Scott Lloyd, Lord Mayor of Parramatta. "This visit is an opportunity to show the important work we do in the community to enable people with disabilities to lead more independent lives,” TAD Chief Executive Officer, Danny Kapustin said. “It is important people get the right equipment at the right time and we are honoured the Governor-General and Lady Cosgrove could join us today to and give this opportunity to show the difference our volunteers make every day,” Mr Kapustin added. The visit by the Governor-General and Lady Cosgrove marks the start of a series of Anti-Poverty Week activities from 12 – 18 October, including visits by the Governor-General and Lady Cosgrove to communities and individuals affected by poverty and hardship in western Sydney.